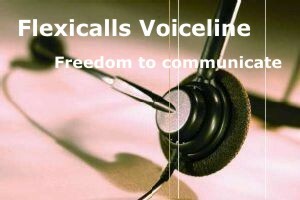 Flexicalls Voiceline is a Voice over IP service (VoIP) that allows you to make and receive telephone calls using the internet. This means lower rates and great savings for you. With the XJ10 wireless handset you can take your Flexicalls service anywhere there is a wireless network. Take it on your next business trip or vacation. This agreement (“Agreement”) is between FlexiSystems Inc. (“FlexiSystems”) and an end user (“User”) of the Flexicalls voice line (“Flexicalls”). Any Flexicalls services or products (“Services”) provided by FlexiSystems to User shall be governed by the terms and conditions herein. By activating the service the End User acknowledges reading, understanding and acknowledging this Agreement and accepts the terms and conditions herein. User acknowledges that they are of legal age to enter into this agreement. TERMS AND CONDITIONS. The terms and conditions stated herein are in lieu of and replace any and all terms and conditions set forth in any document issued by User, including, without limitation, purchase orders and specifications. ANY ADDITIONAL, DIFFERENT, OR CONFLICTING TERMS AND CONDITIONS ON ANY SUCH DOCUMENT ISSUED BY END USER AT ANY TIME ARE HEREBY OBJECTED TO BY FlexiSystems, AND ANY SUCH DOCUMENTS SHALL BE WHOLLY INAPPLICABLE TO ANY SALE MADE OR SERVICE RENDERED HEREUNDER AND SHALL NOT BE BINDING IN ANY WAY ON FlexiSystems. No waiver or amendment of this contract or these terms and conditions shall be binding on FlexiSystems unless made in writing expressly stating that it is such a wavier or amendment and signed by an authorized representative of FlexiSystems. TERM. The term of this Agreement (‘Term”) begins the date the User purchases Services and continues for the duration of the service period as defined by the service plan that is selected by End User (“Plan”). At the end of the current Term, the Term is automatically renewed unless end user provides FlexiSystems prior to the end of the current Term of notification of intention to cancel the service. End User agrees to pay for Service for the duration of the Term. If User chooses to cancel service before the end of the current Term, there will be no reimbursement of monthly service fee paid or money placed on reserve account. PAYMENT. All monthly fees need to be paid to continue monthly service plan. Service provided is on a prepaid basis only. NON-PAYMENT. If User account remains inactive for ninety (90) days, then account will be considered inactive and User stand the risk of losing their number. If after a period of inactivity User wishes to start using service again, User understands and accept that a new Term has begun and User may receive a different voice line number than the number previously provided. EQUIPMENT. To provide the Service FlexiSystems will provide voice line adapter (“Equipment”) to User at the current selling price of the equipment. FlexiSystems liability for delivery shall cease, and title, (if applicable) and all risk of loss or damage shall pass to User upon delivery to carrier. User will be provided with twelve (12) months manufacturer’s warranty from the date of purchase of Equipment or Service. User shall be required to obtain authorization from FlexiSystems to return any Equipment. FlexiSystems will provide replacement of Equipment only if the Equipment is deemed to be defective and covered under the manufacture’s warranty. FlexiSystems will not cover replacement of Equipment that is lost, stolen or modified. Equipment returned by User that is not covered under warranty may be refused by FlexiSystems, and User will be responsible to pay return shipping charges. Shipping charges and any excise and sales duty, or taxes is not refundable. CREDITS. User acknowledges and agrees that the Services are provided “as is, where is.” Credit allowances for interruption of the Services shall not be provided. TELEPHONE NUMBER. Any telephone number provided by FlexiSystems (“Number”) to the User shall be leased and not sold. User is not to use the number with any other device other than the Equipment provided by FlexiSystems. Numbers issued are the property of FlexiSystems and cannot be transferred to any other service. LOST, STOLEN, ALTERED OR BROKEN EQUIPMENT. User shall not modify the Equipment in any way nor shall User use the Equipment except with the Services provided hereunder. End User is responsible for all lost, stolen or broken Equipment and will be required to purchase a replacement to continue service. Replacement charges will be based upon the fair retail price of the equipment, plus any applicable shipping costs and taxes. User shall immediately notify FlexiSystems of any stolen or lost equipment. Failure to do so in a timely manner will cause User to be responsible for any reserved funds used on User’s account and lost of monthly service plan fee. PROHIBITED USES. Any use of the Service or any other action that causes a disruption in the network integrity of FlexiSystems or its vendors, whether directly or indirectly, is strictly prohibited and could result in termination if the Services. User understands that neither FlexiSystems nor its vendors are responsible for the content of the transmissions that may pass through the Internet and/or the Services. User agrees that it will NOT use the Service in ways that violate laws, infringe the rights of others, or interfere with the users, service, or equipment of the network. User agrees and represents that it is purchasing the Services/and or Equipment for its own internal use only and shall not resell, transfer or make a charge for Services or the Equipment without the advance express written permission of FlexiSystems. Such use shall not include certain actives, but not limited to fax broadcast, fax blasting, telemarketing, continuous connectivity, autodialing, extensive call forwarding or any other such activity which is not within the realms of personal, or small business use. PRIVACY. FlexiSystems utilizes the public Internet and third party networks to provide voice communication services. Accordingly, FlexiSystems cannot guarantee the security of voice communication to User. FlexiSystems is committed to respecting a User’s privacy. Once User chooses to provide personally identifiable information, it will only be used in the User’s relationship with FlexiSystems. FlexiSystems will not sell, rent or lease Users’ personally identifiable information to others. Unless required by Law or subpoena or if End User’s prior permission is obtained. Moreover, upon the appropriate request of a government agency, law enforcement agency, or court or as otherwise required by law, FlexiSystems may disclose personally identifiable information. RETURNS. No Equipment may be returned by User for any reason without prior approval of FlexiSystems. Returns will only be approved by FlexiSystems if the return is in need of repair or exchange that is covered by the manufacturer’s warranty. No broken or otherwise damaged Equipment will be accepted. Repairs or exchanges will be done in a responsible and timely manner. TECHNICAL SUPPORT. FlexiSystems provides technical support to Users via telephone and e-mail for the Services and the Equipment provided hereunder. Support for other applications and uses is not provided or implied. BREACH. In the event that the User breach the term of the Agreement, including without limitation, failure to pay any sum due hereunder User shall reimburse FlexiSystems for all attorney, court, collection and other cost incurred by FlexiSystems in the enforcement of FlexiSystems rights hereunder and FlexiSystems may keep any deposits or other payments made by User. INDEMNIFICATION. User agrees to defend, indemnify and hold FlexiSystems, its affiliates and its vendors harmless from any claim or damages relating to this Agreement. DISCLAIMER OF CONSEQUENTIAL DAMAGES. IN NO EVENT SHALL FLEXISYSTEMS OR ITS VENDORS BE LIABLE FOR ANY SPECIAL, INCIDENTAL, INDIRECT, PUNITIVE OR CONSEQUENTIAL DAMAGES OR ANY DAMAGES INCLUDING BUT NOT LIMITED TO LOSS OF DATA, LOSS OF REVENUE OR PROFITS, OR ARISING OUT OF OR IN CONNECTION WITH THE USE IF INABILITY TO USE SERVICE OR PRODUCTS PROVIDED HEREUNDER WHETHER DUE TO A BREACH OF CONTRACT, BREACH OF WARRANTY, THE NEGLIGENCE OF FLEXISYSTEMS OR ITS VENDORS OR OTHERWISE. WARRANTY AND LIABILITY LIMITATIONS. FLEXISYSTEMS MAKES NO WARRANTIES, EXPRESS OR IMPLIED, INCLUDING BUT NOT LIMITED TO, ANY IMPLIED WARRANTIES OF MERCHANTABILITY OR FITNESS FOR A PARTICULAR PURPOSE. NEITHER FLEXISYSTEMS NOR ITS VENDORS WILL BE LIABLE FOR UNAUTHORIZED ACCESS TO FLEXISYSTEMS OR END USER’S TRANSMISSION FACULTIES OR PREMISE EQUIPMENT OR FOR UNAUTHORIZED ACCESS OR ALTERATION, THEFT OR DESTRUCTION OF END USER’S DATA FILES, PROGRAMS, PROCEDURES OR INFORMATION THROUGH ACCIDENT, FRAUDULENT MEANS OR DEVICES, OR ANY OTHER METHOD REGARDLESS OF WHETHER SUCH DAMAGE OCCURS AS A RESULT OF FLEXISYSTEMS OR ITS VENDORS’ NEGLIGENCE. ANY CLAIMS AGAINST FLEXISYSTEMS MUST BE MADE WITHIN 30 DAYS OF THE EVENT OF THE CLAIM OR 30 DAYS FROM THE TERMINATION OF THE SERVICE WHICHEVER IS EARLIER AND FLEXISYSTEMS HAS NO LIABILITY THEREAFTER. FLEXISYSTEMS LIABILITY IS LIMITED TO REPAIR, REPLACEMENT, CREDIT OR REFUND OR PURCHASE PRICE ONLY AND DOES NOT INCLUDE ANY SHIPPING, DUTY OR TAXES. FLEXISYSTEMS MAY ELECT TO PROVIDE A REFUND IN LIEU OF CREDIT, REPLACEMENT OR REPAIR AND SAID CREDIT SHALL NOT EXCEED PURCHASE PRICE. ALL WARRANTIES COVER ONLY DEFECTS ARISING UNDER NORMAL USE AND DO NOT INCLUDE MALFUNCTIONS OR FAILURES RESULTING FROM MISUSE, ABUSE, NEGLECT, ALTERATION, MODIFICATION, IMPROPER INSTALLATION OR REPAIRS BY ANYONE OTHER THAN FLEXISYSTEMS. UNDER NO CIRCUMSTANCES SHALL FLEXISYSTEMS TOTAL LIABILITY HEREUNDER EXCEED THE AMOUNTS PAID BY END USER TO FLEXISYSTEMS IN THE PRIOR THREE MONTHS FROM DATE OF CLAIM. EXPORT COMPLIANCE. User agrees to comply with the U.S. Export laws concerning the transmission of technical data and other regulated materials via the Services. User agrees to comply with applicable local, state and federal regulations governing the locality in which the Equipment and Services are used. EVENTS BEYOND OUR CONTROL (FORCE MAJEURE). FlexiSystems shall not be liable for any delay from acts of God, riot, flood, hurricane, fire, war, embargoes, strikes, labor disputes, government intervention, late delivery of Equipment by suppliers or any other unforeseen events that occur disputes FlexiSystems’ best efforts. Arbitration. Disputes or claims between User and FlexiSystems relating to the Service or Equipment provided relating to this agreement will be resolved by arbitration before a single arbitrator administered by the American Arbitration Association according to its Commercial Arbitration will be conducted in Miami, Florida and shall be in English. All parties agree that the Arbitrator has the authority to: (a) award relief in excess of what the Agreement provides; or (b) awarded punitive or exemplary damages. Judgment awarded by an arbitrator may be entered in any court having jurisdiction thereof. All claims shall be arbitrated individually and User shall not join any class action suit of any kind in court, or in arbitration or seek to consolidate or bring any previously consolidated claims in arbitration. User acknowledges that this provision for arbitration constitutes a wavier of any right to a jury trial. The Agreement and relationship between User and FlexiSystems shall be governed by the laws of the State of Florida without regard to its conflict of law provisions. To the extent court action is initiated to enforce an arbitration award or any other reason consistent with Section 20, User and FlexiSystems agrees to submit to the personal and exclusive jurisdiction of the courts within the State of Florida, to the extent possible in Miami, Florida and waive any objection as to venue or inconvenient forum. The failure of FlexiSystems to enforce any rights or provision of this agreement does not constitute a waiver of such right or provision. If any provision of the Agreement is found b a court of competent jurisdiction to be invalid, the parties nevertheless agree that the court should endeavor to give effect to the parties’ intentions as reflected in the provision, and the other provisions of the Agreement remain in full force and effect. User agrees that regardless of any statue or law to the contrary, any claim or cause of action arising out of or related to use of the Service or the agreement must be filed within ninety (90) days, after such claim or cause of action arose or forever be barred. 22. ENTIRE AGREEMENT. The terms and conditions of this Agreement constitute the entire agreement with regard to this sale and expressly supersede and replace any prior or contemporaneous agreements, written or oral, relating to the Services. This agreement shall be binding upon the heirs, successors, and assignees of FlexiSystems, and User.